The Cambridge Platonists had a major influence on modern thought, between the first major reception of Descartes and European Romanticism. They attempted to negotiate the claims, on the one hand, of the inherited Hellenic–Christian synthesis of antiquity and, on the other hand, the startling new mechanical vision of the universe presented by Galilean-Cartesian science. In the period between Descartes and Newton, they were fully engaged with the major developments of contemporary philosophy and science. Trenchant critics of leading seventeenth- century philosophers, such as Descartes, Hobbes and Spinoza, they developed a distinctive conception of nature as an antidote to the early modern mechanical philosophy. Their contribution to their moral philosophy is a major source for modern secular ethical theory and ideas of tolerance. Their legacy to modern thought includes central concepts, such as Monotheism, Materialism, Self-Consciousness. Among their fold we find some of the first women writers of philosophy, including Anne Conway, Mary Astell and Damaris Cudworth. Their influence in Europe was sustained well into the late eighteenth-century. Through its take-up by, among others, Lord Shaftesbury their moral philosophy was mediated to the Scottish Enlightenment. 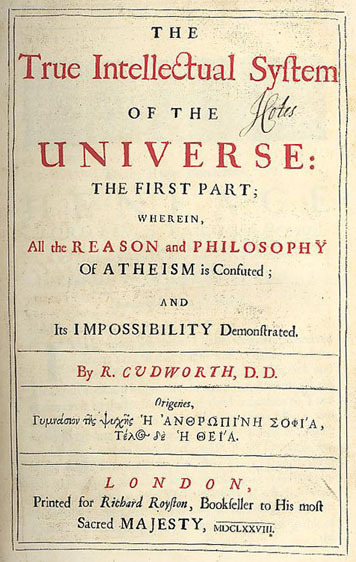 They influenced the development of the so-called ‘hylozoic’ atheism by Diderot, and of German Naturphilosophie, which formed such a core element in European Romanticism. They contributed most notably to the Greek-Platonic revival in Germany of the 1760’s which affected such luminaries as Herder and Goethe. A conference on the contents and the role of the Platonic commentary tradition in the Renaissance. Speakers: Michael Allen, Anna Corrias, Dilwyn Knox, Jacomien Prins, Valery Rees.